No more rumors and teasers, it’s finally happened. Soon-to-be Microsoft-owned Nokia has made an Android phone. Three Android phones actually. Nokia announced the Nokia X line at Mobile World Congress in Barcelona today, and it features three phones targeted at the entry-level market. There’s the Nokia X, Nokia X+ and the Nokia XL. The Nokia X and X+ are virtually identical in specs, but the X will be slightly cheaper and will release in Asia, Eastern Europe, South America and other territories. It won’t be released in the US, Western Europe, Japan and Korea. The Nokia X has a 4-inch screen, 3MP fixed-focus camera, Qualcomm Snapdragon S4 processor, 512MB of RAM and 4GB of storage. It will also have a microSD slot for adding storage, as well as a dual-SIM slot. The Nokia XL on the other hand is mostly the same, but bumps the screen size to 5-inches and has an improved 5MP auto-focus camera. The real story here, however, is the software running on these phones. Nokia has opted to put Android on the Nokia X line, and a very old version of Android at that. Android 4.1.2 to be exact. But you wouldn’t really recognize it as Jelly Bean, since the company has built their own “forked” version of Android, similar to what Amazon has done with their Kindle Fire tablets. Nokia’s version of Android actually looks a lot like Windows Phone, featuring a tiled interface with the ability to resize tiles and some particular apps displaying updated information. And with these prices, they might just succeed at doing so. The Nokia X will be priced at 89 Euros (around $120), the Nokia X+ will be 99 Euros (around $135) and the Nokia XL will be 109 Euros (around $150). 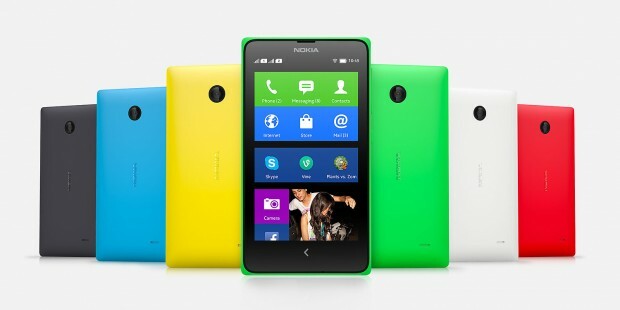 The Nokia X will be go on sale immediately, and the Nokia X+ and XL will follow in the second quarter of this year.